The UK 7"-release features a background in various shades of red and brown. 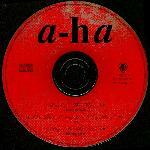 A large a-ha-logo seems to be glowing in different shades of the colours orange and yellow in the mid-section of the sleeve. "Dark Is The Night" is written in small white letters below the logo. The reverse offers a similar lay-out concerning background and logo, but the logo is partially covered by a 2�"x3�" brown and white group-shot (identical to the one used for "The Blood That Moves The Body '92"-releases). Track listings plus extra information is printed in white below the group-shot. In addition there are two small pictures advertising the forthcoming album "Memorial Beach" and video "Live In South America". While "Dark Is The Night" (3:45) is taken from the forthcoming album, the flip is an instrumental version of "Angel In The Snow" (4:15) mixed by Jamey Staub and Pål Waaktaar. Part 1 of the CD set is a fold-out digi-pak. 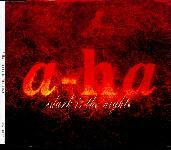 The front cover is similar to the front of the 7", whilst the reverse differs slightly from the back cover of the 7" - the a-ha-logo and small pictures of the video and album have been omitted. The left hand inside flap has a black and white full-length band picture (Morten, Pål and Magne) while the other is black with white titles and small colour pictures of "Memorial Beach" and "Live In South America". Both flaps fold out to hold the two parts of the CD set. One side houses the first CD where as in the other side there is a black cardboard `CD' with white edges and white titles advertising the tracks on the second disc. The mid-section of the digi-pak has a black and white picture of the band. The CD which comes with this digi-pak is a black and white picture CD which features a picture of Morten (as on the inside of the digi-pak). At the bottom of the CD, the tracks are listed in white on a black square. The CD features the tracks on the 7"-single plus the live version of "I've Been Losing You / Cry Wolf" (9:07) taken from the "Live In South America" video. The second part of the set comes in a cardboard wallet sleeve with a very similar cover to the digi-pak but with a smaller picture and more text on the reverse. 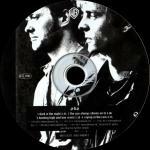 The CD features a black and white picture of Magne and Pål (as on the inside of the digi-pak). The tracks are listed in white on a black square at the bottom of the disc. This CD features three album tracks and the 7"-remix version of "Hunting High And Low". The German CD single (see below) was also used for promotional purposes in the UK. It comes with a "promotional copy only not for resale" sticker plus a wea sticker with contact numbers of staff and stamped with the date 24 May 1993. The cassette single has similar cover to the 7" except that it has been rotated so that the logo reads from bottom to top. The reverse of the insert opens up and has a group picture as on the back of the 7" printed in black and white down the left side (rotated in the same direction as the front cover) with text written underneath in white on a black background. The spine of the cassette is black with white text. The black cassette with white text features the same tracks as the 7", one track on each side. Germany: The 7" vinyl and 5" CD-single from Germany offer on this occasion only slight variations to the UK releases, the fronts of both have the title of the single written in slightly different style of handwriting and is also put in quotation-marks. The 7" also has a darker coloured front sleeve . The reverse of the 7" is dark red and features a smaller photo (2"x3"). In addition both the a-ha-logo and the adverts for forthcoming releases are omitted. Finally the track listings have been printed in a different style of writing. The CD comes in a jewel case. The reverse of the insert is grey with white titles and a black and white group picture. The CD is red with silver branch effect, black a-ha-logo and titles. The tracks are the same as on the UK CD part 1. The regular German release was also used for promotional purposes and comes with a 1-sided wea information sheet with information (in German) on the single and album. Single release date: 30 April 1993. Note: The Dark Is The Night single can also be found inside a special Memorial Beach promo case. Click here for details. Japan: The Japanese 3" CD comes in a snap-pack with a light grey cover. The picture from the cover of the European release is placed in the top half of the sleeve but slightly lower than usual leaving a grey strip along the top. Below this there are Japanese titles written in dark red plus other text written in black. The reverse of the snap-pack is white with black text including the lyrics in English and Japanese plus a tiny black and white picture of "Memorial Beach". The CD is silver coloured with black WB-logo and text. The US promo of "Dark Is The Night" was also promoted in Japan. It comes with a black and white printed / handwritten sleeve. It features a band shot (Pål, Morten, Magne) in the bottom left hand corner of the sleeve. It comes with the same back insert as the U.S. promo single (see below). Translation of the text on the promo sheet is as follows: "From super pop group to real rock band. 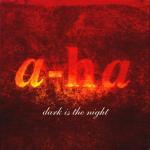 The 1st single from their 5th album: A-HA "Dark is the night" Intro 33 seconds. C.O. 3 min. 46 sec. On sale: 6/8 (WPDP-6329) New album Memorial Beach On sale: 6/25 (WPCP-5333)". Taiwan: The Taiwan CD release of "Dark Is The Night" has a similar sleeve and disc to the German release. It comes with a brown patterned obi strip. Promotional copies of the single may include a white promotional sticker on the reverse of the jewel case with black Taiwan text. The front of the sleeve may also have an embossed promotional stamp punched into it. 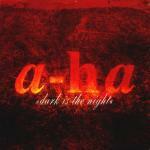 USA: The US 5" 1-track promotional CD-single features the album version of "Dark Is The Night". It comes without a regular disc-sleeve insert. However, there is a Warner Brothers backing insert similar to the one for the "Crying In The Rain" US promotional release. The disc is silver with black titles. There is also a cassette single with second track "Between Your Mama And Yourself". It comes in a card slip case. The cassette is black with white text and there is one track on each side.